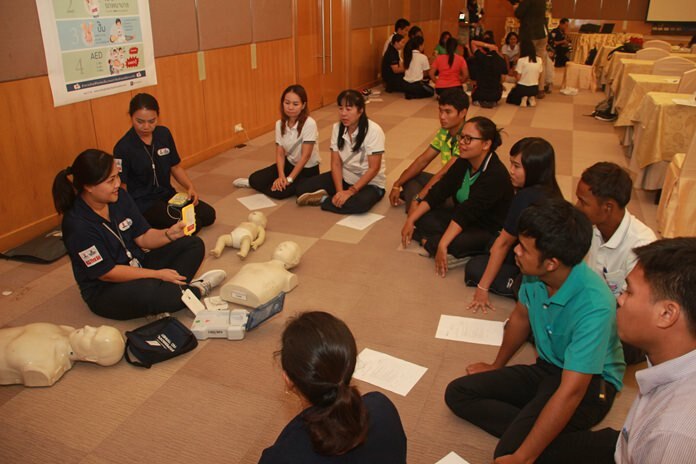 Bangkok Hospital Pattaya provided basic life support and CPR courses to teachers and businesspeople in Sattahip and Pattaya. Hospital assistant director Dr. Komsan Wasuwanitch opened the March 30 free workshop for 50 people. The training included four key steps in basic life support: keeping injured people awake, calling emergency services, cardio pulmonary resuscitation, and using an automated external defibrillator. Participants were shown how to use their hands to compress the chest in CPR and how many beats per minute. They also were taught to properly provide mouth-to-mouth rescue breaths and, if necessary, shock a victim with the AED. Hotels and large department stores have AEDs installed near fire extinguishers for ease of use. However, use of the electrical equipment requires expertise and training. The seminar included both practical and theory study and those completing the course successfully will be presented with certificates next month. Hospital trainer Navee Conrath said BHP is ready to train government and private organizations in basic life support in groups of at least 30 at no charge. For more information, call 089-826-1680.